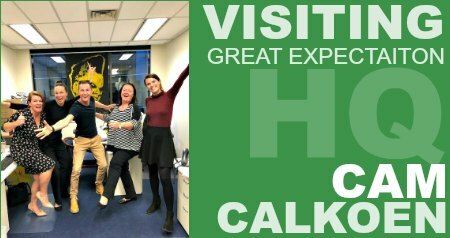 Cam Calkoen visited the Great Expectation team recently. We ask him some questions about his topics and main keynote themes. How do you shape the Big Picture? I believe ‘the big picture’ comes into our life at a relatively early stage, it’s the ability to dream and imagine what is possible in life. For me I always wanted to live a life where I could travel, entertain and connect with a lot of people, that was my big picture and through experiences (both good and bad) I’ve been able to shape that into what I do today as a speaker, traveling, entertaining, connecting; connecting people with inspiration, people with dreams, people with people. To me ‘the big picture’ is the life you want to create and the world you wish to contribute to. How does attitude make a difference? Attitude is everything. I hear some people saying that they don’t have a dream, to me that’s unbelievable, everyone has a dream but what happens is some let their perceived reality; living situation, stage of life, finances, disability… get in the way, they have an attitude which blocks their altitude. As I travel around the world I hope to see more and more people become opportunity centric, because when we see the best in things, we see the best in us and the world. With the right attitude anything is possible, infant right now it could bring a huge change to your life. How does Competition bring out excellence? I became the New Zealand champion for Athletes with Cerebral Palsy. As an athlete I traveled my country looking for the best competition, I then traveled Australia, and when I won championships there, and I then traveled the world. Looking for people who were stronger, fitter, faster than me gave me inspiration as to what was possible and direction on how to get there. I would often seek races against people without disabilities to lose against, but the thing with having to chase, is it forces us to stretch, to think differently and then fly when we are the ones been chased. We’re only great if we have someone to compete against, so sometimes it’s also about seeing how we are growing the field of competition because that forces us to keep innovating. Can you explain your topic 'the excuse for under-living your life’? I’ve competed against people with disabilities. I’ve also mentored people with disabilities but the biggest disability I see in society, is not through the way someone walks and talks. It's a mind issue, society becomes blinded by excuses. They think that where they are is where they must stay. Life is less about becoming comfortable and more about seeking your passion, your purpose, your identity. We can start that kind of thinking at any moment, we just need to eliminate the excuses. What is your take on personal accountability? Instead of worrying about the way I walk, I decided to be inspired by the greatest athletes in the world to become an athlete myself. Instead of worrying about the way I talk and seeing my speech as an impediment, I decided to see it as and ‘accent’. I was inspired by incredible speakers to become a speaker myself. And instead of worrying about what people may think, I decided to give them things to think about. People often say, “gosh you were lucky to have had such incredible parents”, and yes I was. I had great schooling too, but I’ve met people with equally amazing parents who don’t do much or are simply dam awful people. Similarly, I’ve met people from low performing schools, whose parents were barley around, and their success inspires many. 'Luck' is a reflection of what we see, what we do, and what we create. If it’s meant to be, it’s up to me. If you would like to know more about Cam Calkoen and his keynote presentation topics click here to submit your enquiry, or contact us directly on 1300 55 64 69. Cam inspires people with universal backgrounds to dream big, because with big dreams comes a big life. He doesn’t hide from the fact that he is still on a journey, that his Everest is yet to be conquered. But perhaps it is his uniqueness as a speaker to be sharing his awesome journey in striving for an awesome outcome that sees audiences connect with his message, and absorb an energy that moves, touches and inspires. Read more.